Marvel Minimates Series 71 Marvel’s Guardians of the Galaxy Vol. 2 Asst. For some official photos and full details read on. The greatest mix-tape in the galaxy is back! The unlikely team of misfits known as Marvel’s Guardians of the Galaxy is coming back to our solar system with a new movie, and DST is marking the occasion with a new assortment of Minimates based on the film! 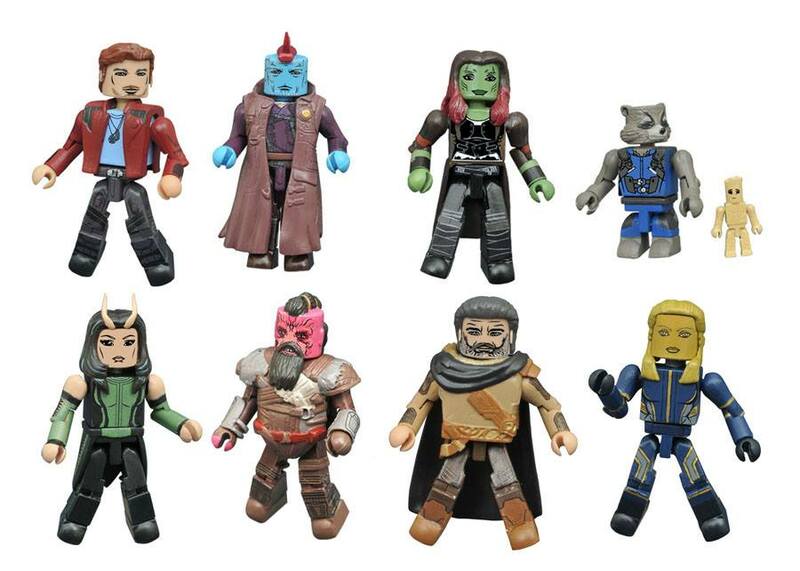 Four new two-packs capture the main cast in 2-inch mini-figure form: Star-Lord pairs with Yondu, Gamora with Rocket and Groot, and two comic-shop-exclusive sets feature Ego with Ayesha and Taserface with Mantis. Each Minimate features up to 14 points of articulation and fully interchangeable parts, and each 2-pack comes in a full-color window box. You’re welcome! Case assortment contains 12 two-packs total, 4x Star-Lord, 4x Gamora, 2x Ego and 2x Taserface. The Devil of Hell’s Kitchen is back, with a new friend and two new frenemies! Based on Season 2 of the Daredevil TV series on Netflix, this box set of four Minimates mini-figures features Daredevil as he appeared in the infamous stairwell fight, plus Elektra, Stick and Karen Page! Each 2-inch Minimates mini-figure features 14 points of articulation, fully interchangeable parts, and a display stand. The set also includes a duct-taped gun hand and chain for Daredevil, a removable hat and alternate head for Stick, a laptop and Frank Castle’s X-Ray for Karen, and sais and an alternate head for Elektra. Packaged in a full-color window box. Say his name! The newest Marvel TV star is Luke Cage, a.k.a. Power Man, and the Marvel Minimates line is celebrating the release of his first season with a box set of Minimates based on the Netflix series! Luke Cage, Misty Knight, Cottonmouth and Mariah Dillard each measure approximately 2 inches tall and feature up to 14 points of articulation. Each figure features interchangeable parts and accessories, and Luke Cage can transform from his hooded streetwear to his post-experiment Power Man look! Figures come packaged in a full-color window box. Gotham City is getting stranger, and so is the Gotham Minimates line! Based on the latest season of Gotham on Fox, this all-new box set of 2-inch Minimates mini-figures features Dr. Hugo Strange, Detective Harvey Bullock, Dr. Leslie Thompkins and the villainous Victor Fries (a.k.a. Mr. Freeze)! Each Minimate features up to 14 point of articulation, and fully interchangeable parts and accessories – Strange can change from his suit to his surgical gown, Fries includes his powerful freeze ray, and Bullock comes with coffee and donuts! Each figure also includes a clear display stand. Set comes packaged in a full-color blister card. Who knew Harley Quinn was such a mistress of disguise! 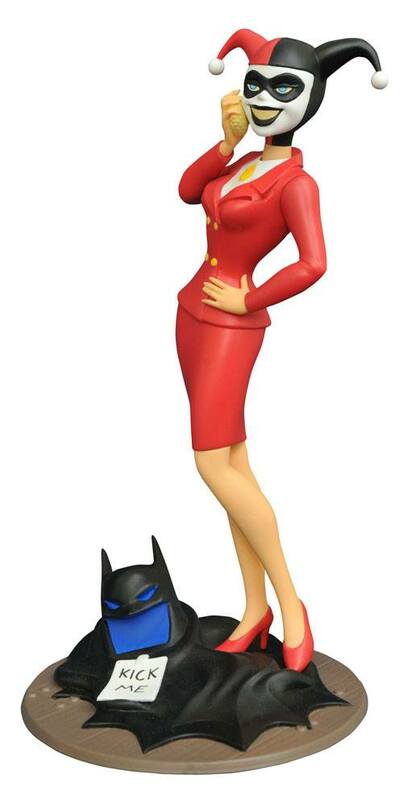 In this all-new PVC figure based on Batman: The Animated Series, a suit-wearing Harley Quinn re-applies her make-up after going undercover as a lawyer in the classic episode “The Man Who Killed Batman.” At her feet lies Batman’s cape and cowl, with a “Kick Me” sign stuck to the back. This 9” scale PVC figure features collectible-quality sculpting and paint applications, and is in scale to all Gallery and Femme Fatales PVC figures. Packaged in a full-color window box. Sculpted by Varner Studios! Criminals beware, the Huntress is here! The enemy of organized crime, the Huntress is part of Batman’s extended family of crime-fighters, and is also a member of the Justice League! 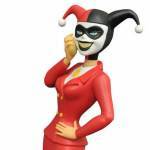 Based on her appearance in that classic animated series, this 9” scale PVC figure rests on a diorama base, and is in scale to all Gallery and Femme Fatales PVC figures. Packaged in a full-color window box. Sculpted by Varner Studios. It’s the girl who would be Power Girl! Created by Cadmus Labs as a clone of Supergirl, Galatea was aged to her physical prime without the moral influences that guided her genetic twin, and became an enemy of the Justice League. Sculpted at a 9-inch scale, this dynamic PVC figure has Galatea hovering over a diorama base, and features detailed sculpting and paint applications. The figure comes packaged in a full-color window box, and is in scale to all Femme Fatales and Gallery PVC figures. Sculpted by Varner Studios!